(Host) A couple-dozen people gathered at Ben and Jerry’s corporate headquarters in South Burlington last night to learn more about Occupy Wall Street. As VPR’s Jane Lindholm reports, the socially-conscious company is officially endorsing the movement. (Corbin) "First thing I’d like is, would it be alright with folks if you tried to pair up with someone you don’t know super well or maybe didn’t’ come with?" (Lindholm) The crowd may have been small, but there was a lot of interest and enthusiasm in the Cookie Dough Room at Ben and Jerry’s last night. They had come to hear and be heard by a couple of the Occupy Wall Street organizers who have been with the movement from the beginning: Sam Corbin and Matt Smucker. (Corbin) You all are so friendly, I don’t even need to give you a topic to talk about, you just go for it. Hey! Mic check! Mic check!" (Lindholm) Smucker and Corbin were in town not only to share their experiences with sympathetic Vermonters, but with top managers at Ben and Jerry’s. The ice cream company has long been aligned with social causes. Founder Jerry Greenfield encouraged the company to hand out ice cream in Zuccotti Park as soon as the movement got started. And the company’s Board of Directors issued a statement of solidarity with the movement right away. But the company wants to do even more. 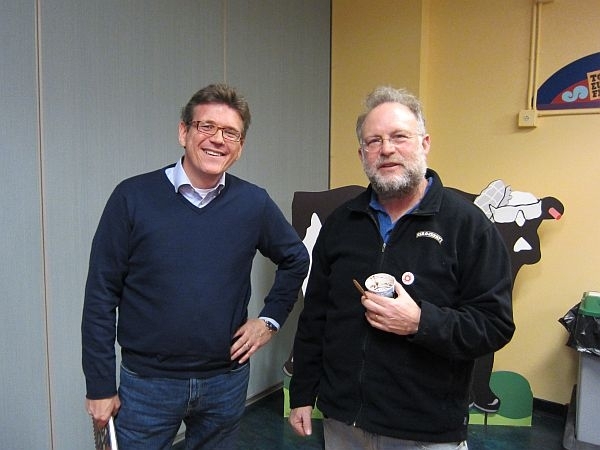 Jostein Solheim is the current CEO of Ben and Jerry’s which is owned by the Unilever Corporation. (Solheim) "For us this was just so right, and so clear. We’re a company that’s all about creating what we call linked prosperity networks where everybody in the chain prospers, everybody gets something out of the business. And that’s our mission, it’s always been our mission." (Lindholm) Solheim says the company’s stand has gotten some shocked reactions from others in the business community, but he’s confident Ben and Jerry’s can play a role by looking at what he calls the "excessive power and influence" corporations have over democracy. (Solheim) "That’s something we have credibility in and something we can talk with authority about and help out on. So that’s why we’ve chosen to focus on that area. We have launched a campaign called ‘Get the Dough Out of Politics.’ Little cookie dough joke." (Lindholm) The campaign is aimed at passing a constitutional amendment that would overturn the Supreme Court decision known as Citizens United, which allowed unlimited spending by corporations in electoral politics. While Unilever is officially neutral on political issues, Solheim says the head of the corporation knows what its subsidiary is up to. Some Occupy protesters have raised eyebrows about the involvement of such a large corporation in what has been seen as an anti-corporate movement. But organizer Sam Corbin says the movement continues to evolve. (Corbin) "What’s exciting about it is that it’s constantly changing. And I’m very happy to say I don’t know what is next. I’m constantly delighted to be surprised." (Lindholm) For VPR News, I’m Jane Lindholm. Ben & Jerry’s ice cream is endorsing gay marriage as the British Parliament prepares to debate the issue.